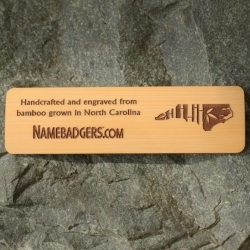 Our unique solid bamboo name badges with naturally curved face and custom laser engraving are made with bamboo grown here in North Carolina. Quantity discounts listed on product pages. 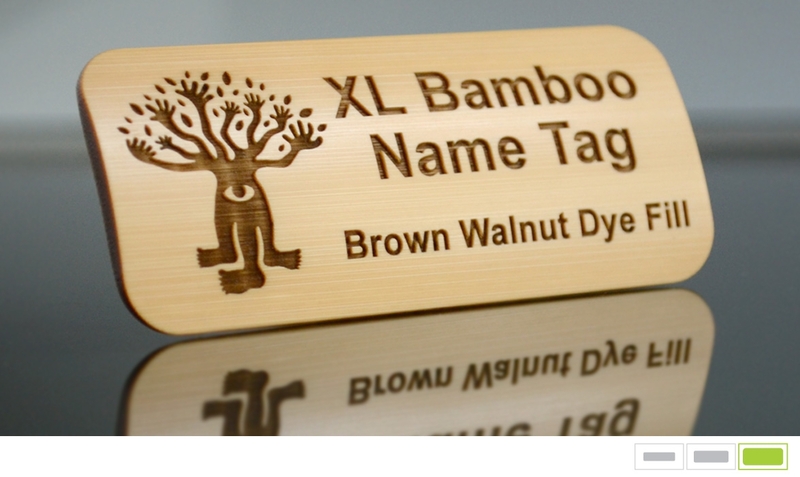 This engraved bamboo name tag with curved face and walnut dye fill measures 2.75 x .75 inches. Laser cut with rounded corners this USA grown bamboo has been sanded and sealed for durability. Badge comes with choice of pin clasp or magnetic back. Natural dye made from local eastern black walnut hulls which contain juglone a brown dye and tannins a natural fixative that creates a strong and durable 100% plant-based brown dye that is almost as dark as our brown paint fill. Some slight variation should be expected in the amount of curve in the bamboo and the tone of the walnut dye fill due to the natural materials being used. Our most popular size and fill option, this beautiful engraved 3 x 1 inch bamboo name tag with walnut dye and unique curved face has been laser cut, sanded smooth and sealed for durability. Badge comes with choice of pin clasp or 2-post magnetic backing. 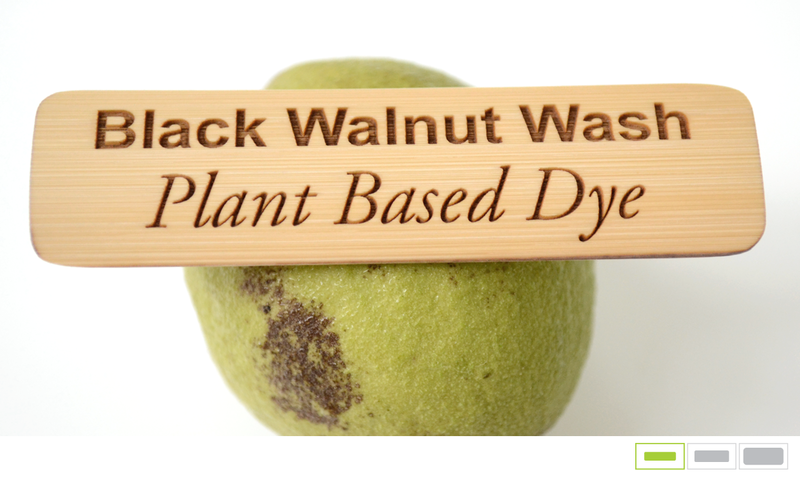 Natural dye made from eastern black walnut hulls which contain juglone a brown dye and tannins a natural fixative that creates a strong and durable 100% plant-based brown dye that is almost as dark as our brown paint fill. 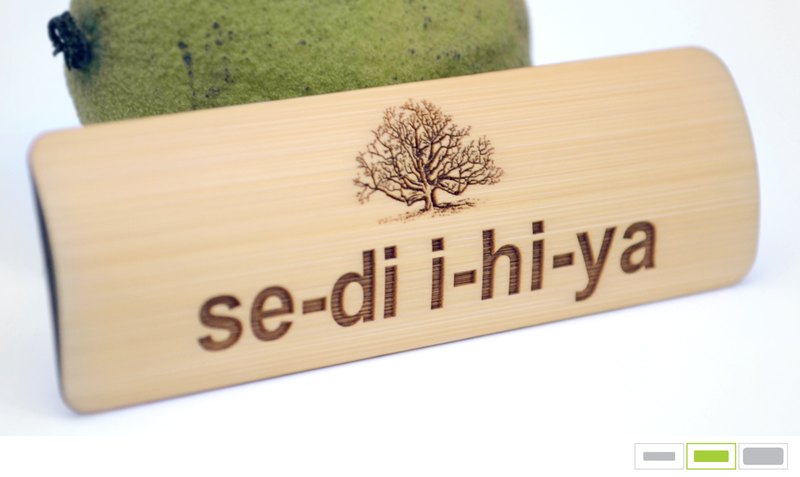 Our largest bamboo name tag, measuring 3.5 x 1.5 inches with naturally curved face and brown walnut dye filled engraving. The laser cut solid bamboo is sanded smooth and sealed for durability while maintaining a natural look and feel. Choice of backing and customization included in the price. Natural dye made from the hulls of native eastern black walnut trees, which contain juglone a brown dye and tannins a natural fixative that creates a strong and durable 100% plant-based brown dye that is almost as dark as our brown paint fill. 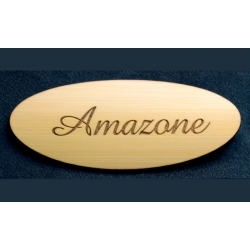 This oval shaped bamboo name tag is 3 x 1.25 inches with brown walnut dye filled engraving. The laser cut shape is sanded smooth and sealed for durability while maintaining a natural look and feel. Choice of backing and customization included in the price. Natural dye made from the hulls of native eastern black walnut trees, which contain juglone a brown dye and tannins a natural fixative that together creates a strong and durable 100% plant-based brown dye that is almost as dark as our brown paint fill. Laser cut bamboo pin with custom laser engraving and brown walnut dye fill. Choice of magnet, pin clasp, or post and butterfly clutch backing. Possible uses include: monogram, logo, guest, host, titles, mini name tag, first name only name tag, member, alumni, family crest, oriented either horizontally or vertically. 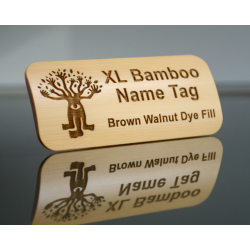 Large bamboo name tag with laser engraving and walnut dye fill measures 3.25 x 1.16 inches and includes choice of pin or magnetic backing. 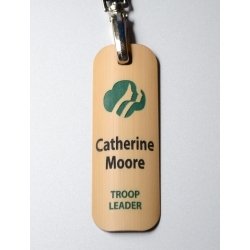 Personalize each badge with your logo and different names and titles as needed. Fully rounded ends highlight the curve and beauty of the bamboo. 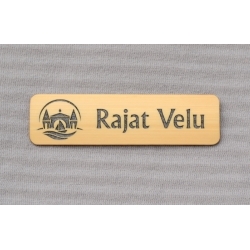 Laser cut and engraved bamboo name badge with curved face that measures 3.5 by 1 inches. Engraving is filled with natural brown dye for superior contrast compared to natural engraved bamboo. Choice of pin or magnet, most people use the magnetic option to avoid pin damage to clothing, also the magnets are nice and strong. 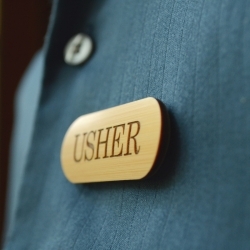 Custom engraved bamboo name badge with neck lanyard. 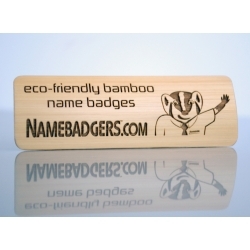 This vertical bamboo badge is 3.5 x 1.25 inches and maintains the natural curve of the bamboo. 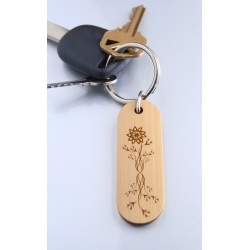 The custom laser engraving is filled with a natural brown dye. The lanyard is high quality with sturdy hardware and is available in your choice of black, white, red or blue neck ribbon, one size fits all. 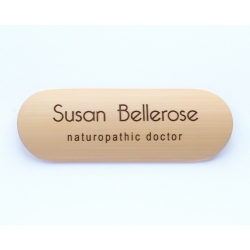 This beautiful small bamboo name badge with paint fill includes your choice of magnetic or pin clasp backing. The face of the badge has a slight curve from top to bottom and a mostly flat back with smooth edges that have been individually sanded and sealed for durability. High resolution laser engraving can hold fine detail to make your logo look sharp at any size. 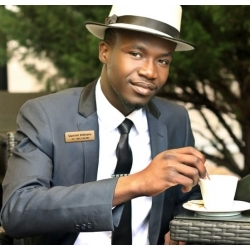 Professional name tags like this style are often configured with a logo, full names and titles, but can also be as simple as first name only, we can customize a layout to suit your needs. 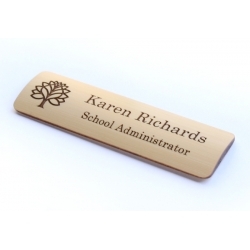 Our most popular size, this 3x1 engraved bamboo name badge has a slightly curved face from the natural curve of the bamboo pole from which it was laser cut, sanded smooth and sealed for durability. Each badge comes with choice of paint fill color and either magnetic or pin backing. Some variation in the curve of the bamboo should be expected since this is a natural product. 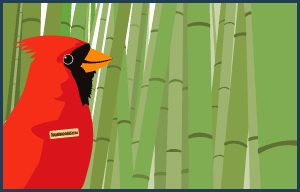 The bamboo used in these badges is grown here in North Carolina, USA. 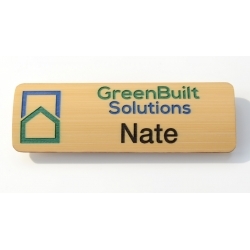 Our biggest bamboo name badge at 3.5 x 1.5 with a naturally curved face, price includes custom laser engraving and your choice of paint fill color and magnet or pin backing. Each badge has been sanded smooth and sealed for endurance. Some variation in the shape should be expected with this natural material. This larger size is often chosen by customers who want the logo, seal, or crest larger especially if it contains small characters, also useful if your team has long titles and/or credentials that you want space for in combination with your logo. 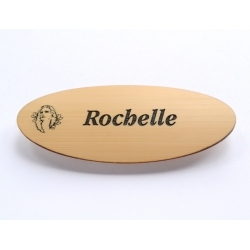 This oval shaped bamboo name tag is 3 x 1.25 inches with paint filled engraving. The laser cut shape is sanded smooth and sealed for durability while maintaining a natural look and feel. 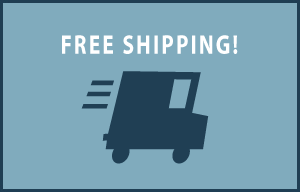 Choice of magnet or pin backing and customization included in the price. Paint filled engraving in your choice of black, brown, green, blue, red or metallic. Some slight variation should be expected in the amount of curve in the bamboo due to the natural material being used. 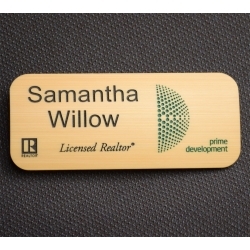 This laser engraved bamboo name badge with 2-color paint fill and magnetic or pin backing is made from a solid piece of curved bamboo that has been laser cut with rounded corners. Each piece is sanded smooth and sealed for durability while maintaining a natural look. The colors need to be divided by at least a quarter inch and can not overlap. We are always happy to create preliminary layouts as needed. 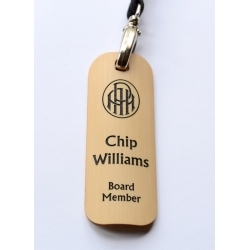 Our multi-color paint fill bamboo name badges feature custom laser engraving that can include your logo and text in 2 or 3 colors. The different colors need some dividing space between them, colors can not touch or overlap. Price includes choice of color combination, magnet or pin backing and custom laser engraving. 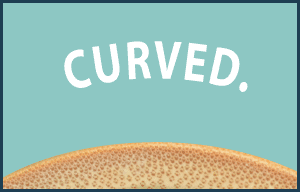 Some variation in the amount of curve should be expected given the natural material. We can create a preliminary layout and visual if you would like to see how your logo or idea would look. 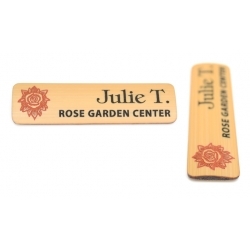 This curved bamboo name badge features laser engraving and 2-color paint fill. Each color needs a dividing space between it and the other color. Choice of pin or magnetic backing. Made in the USA with local bamboo. Some variation in the curve of the bamboo should be expected. Custom laser engraved 2-color paint fill bamboo name badge with neck lanyard. Choice of engraving paint fill colors and lanyard color. High resolution laser engraving across the subtle curve of the bamboo can hold sharp detail, slight variations in the curve of the bamboo should be expected. Each item is sanded and sealed with an oil and wax finish for extended durability. The 2 different paint colors need to be clearly divided and can not overlap or get too close to each other, fine for split left/right or top/bottom, please contact us if you would like to see a preliminary layout. 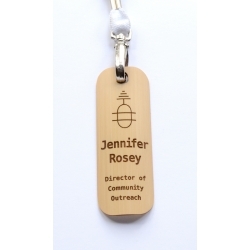 Custom laser engraved bamboo name badge with neck lanyard. Choice of engraving paint fill color and lanyard color. High resolution laser engraving across the subtle curve of the bamboo can hold sharp detail, slight variations in the curve of the bamboo should be expected. Each item is sanded and sealed with an oil and wax finish for extended durability. Laser cut shape with rounded corners, bamboo has a natural look but may appear more orange or unnatural on some screens. 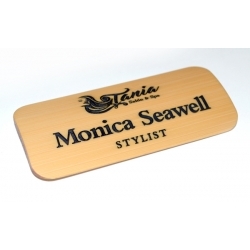 Our engraved bamboo name badges include choice of magnetic backing or pin clasp and 1 of 6 color fill options. 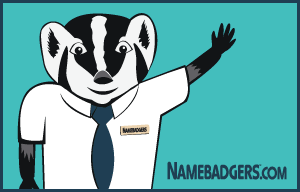 Each badge can be personalized with unique names and titles and can include your logo or seal. This longer shape is useful for full names and titles with a logo to one side, but can be configured to suit your needs. Some variation in the shape occurs, being slightly more or less curved. This bamboo keychain with custom laser engraving and walnut dye fill includes metal loop and keyring. The solid bamboo charm has a face that measures 2.25 x .8 inches. Each piece can be personalized with larger quantity orders, include logos, names, initials, monograms to suit your needs. We harvest the bamboo used here in North Carolina as well as the black walnuts used for making the natural brown dye. This bamboo is sanded smooth and sealed with an oil and wax finish for durability in everyday use. 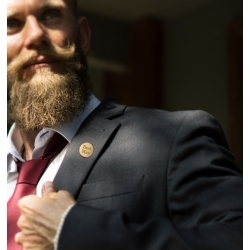 Laser cut and engraved bamboo lapel pin with a walnut dye fill and choice of post and clutch or magnetic backing. 1 inch round with curved face and variable thickness. Each pin can be personalized as needed. High resolution laser engraving is complimented by a plant-based brown dye we make from local black walnut hulls.